Sure it's only been a year since the most recent Pokémon, but this remake is both a blast from the past and something new to play after X and Y.
Pokémon Omega Ruby/Alpha Sapphire is the 2014 iteration of the long running portable game series and the second instalment to arrive on Nintendo 3DS. It comes just over a year after Pokémon X and Y, a title that introduced the seventh generation of monsters and 3D graphics, abandoning the beloved sprite-based art-style. Omega Ruby and Alpha Sapphire doesn't introduce a new generation, but instead joins the growing list of remakes of past entries offered by Nintendo, much like Fire Red/Leaf Green and Heartgold/SoulSilver. This time we're to relive the adventures in the region of Hoenn. How does Ruby and Sapphire hold up as they make their return? Still don't know what Pokémon is about? Really? For those players who are somehow still unsure what the franchise is all about, Pokémon is a Japanese-style RPG where you're a trainer who captures and develops the cute creatures that have given their name to the series, teaching them powerful attacks, entering them into battle in order to level them up while using items and other tactics to help achieve victory. Pokémon Omega Ruby/Alpha Sapphire is a good introductory title for players new to the series, although it should be noted that the difficulty has been increased (for the better) over the most recent game on Nintendo 3DS. While rival trainers are equipped with powerful healing items early in the game, they still act quite erratically when it comes to the battles, and we missed the more aggressive and strategic approaches taken by the enemy AI. 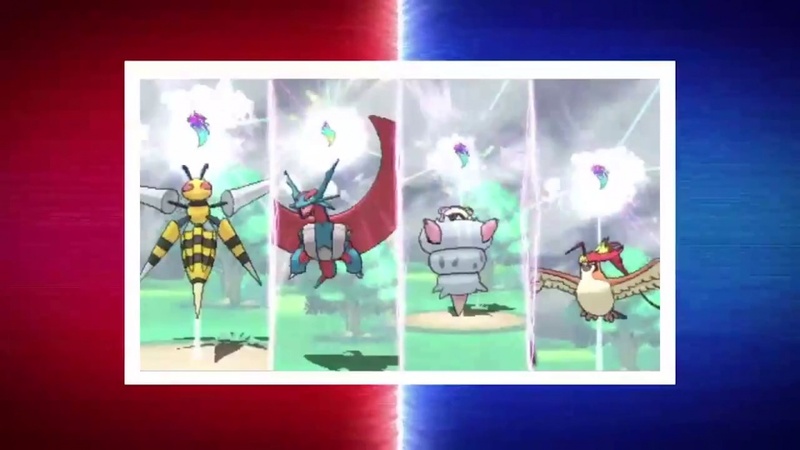 Because of this, as well as other details mentioned below, we must conclude that X and Y is more inviting to newcomers and provides a shallower experience, while Omega Ruby and Alpha Sapphire is the more demanding entry (although still relatively easy) and leaves a sense of progression from X and Y. So, it would be advisable to play this after you've played X/Y. In order to evaluate Pokémon Ruby Omega and Sapphire Alpha we must accept that it has been built on the foundations laid down in X and Y, and when the visuals are directly compared it certainly shines. At first glance, Omega Ruby and Alpha Sapphire is very similar to its 3DS predecessor, and although both titles are quite similar, we find small differences and additions which add more colour and excitement to the new Pokémon title, clearly showing us that we're not facing a rushed annual entry made in time for the holiday season. Re-launching the third generation of Pokémon right now is clearly something Gamefreak and Nintendo have planned for a while, as looking back at creatures available in Pokémon X and Y, the most remarkable absences are monsters from Ruby and Sapphire. The purpose of this remake is, along with Pokémon X and Y, to complete the Pokédex (except for those legendary Pokémon which we assume we may get via online events) in its entirety, making the Nintendo 3DS the very first system in which you can truly catch'em all, thanks to Omega Ruby and Alpha Sapphire, X and Y, and the Pokémon Bank (the handheld's app that allows transfers between games). Beyond the choice of creatures, it seems like the development team has continued to polish the Pokémon X and Y formula, working on it for another year and refining the experience to the fullest. That game was both excellent and impressive, and in this new release there has been progress made in various fields. Visually everything is better and has improved: slowdowns that sometimes occurred in the predecessor are gone, and new designs for the menus, attack buttons and the overall interface look way better than in X and Y, adding up to an improved overall level of presentation. Regarding the new features, the game re-implements all those new elements introduced with Pokémon X and Y, cementing them as essential parts of the franchise and not a sporadic additions in a single entry. So once again the Pokémon-Amie, Super Training and Mega Evolutions make an appearance, the latter being great to discover and exploit in combat. The main new feature alongside these returning from X and Y is the MultiNav. MultiNav is an interactive tool that is displayed on the bottom screen of the 3DS that incorporates several tools. The most noteworthy is a small map of Hoenn, which can be expanded with a simple touch of the screen, and a new tool that details the Pokémon that can be found in the area where the player is at the time, and specifies whether every monster has been captured or whether some remain hidden. This may seem of little consequence or superficial, but their goal is to put power in the player's hands, increasing the user friendliness of the interface, reinforcing this sense of progress from last year. Another major addition to the experience is the stealth movement. With a soft touch to the circle pad, the character begins to walk in a measured and elusive manner, and can avoid encounters with wild Pokémon in the tall grass, at least to some extent. This new move is combined with a new type of encounter. Sporadically, a black shadow appears among the grass representing a Pokémon with a somewhat higher level than normal, as well as some unique characteristics and attacks its species normally wouldn't have. If the player manages to approach stealthily, he or she can fight and capture these special Pokémon, and these are a breath of fresh air during the hunt and will delight both players just looking to catch 'em all, and gamers who go after the best combinations for competitive play. Despite all the additions that Pokémon Omega Ruby/Alpha Sapphire incorporates, the game also knows how to use the nostalgia factor to great effect. As substantial as the aforementioned changes may seem for those who played the original on Game Boy Advance, Hoenn is still the way veterans will remember it. The cities, map, gyms and secret base are all present and accounted for. Characteristic features of the original Ruby and Sapphire have undergone some remodelling, such as Pokémon contests. The system remains similar, but adds more visual flair and additions such as costumes for your trainer and Pikachu. This mix of old and new brings about a positive nostalgic vibe, but without overly relying on the old mechanics. Long story short, Pokémon Omega Ruby/Alpha Sapphire is much more than a remake of the third generation of Pokémon. This is a game that continues the legacy and foundation laid with X and Y, polishing the experience to the max, giving players more power and control over the game with new tools and a new capture mode. Last but not least, it provides us with the opportunity to complete almost the entire Pokédex on the same system with just two games. Pokémon Omega Ruby/Alpha Sapphire is a title that offers tons of hours of playtime, that won't end when you complete the Pokemon League (which can be reached after about 20 hours without hurrying too much); there is more fun to be had after that. This is a new entry that is meant to be the best example of Gamefreak's franchise on 3DS, and the Nintendo handheld's best game this Christmas. It manages to dwarf X and Y and is, in our view, a must-have on the system. The only thing that's negative is that there's no wow factor, the jump is not as big this time, as Omega Ruby and Alpha Sapphire is a safer bet in that it is a remake and does not innovate as much, but it really is more complete. Catch this one, and catch 'em all! Enhances and expands its predecessor. More content, better interface, animations and tools optimise the experience. Hoenn revived for a new generation. No leap in terms of design and innovation as was the case with X/Y.